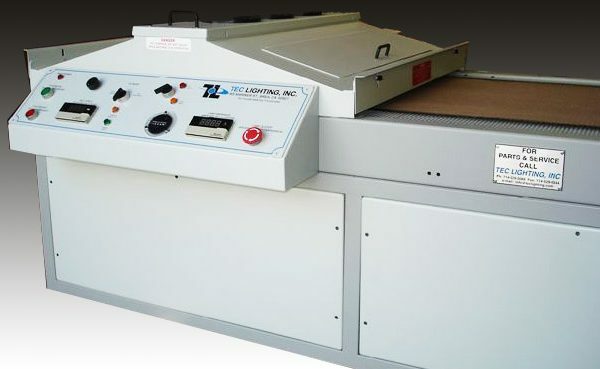 TEC Lighting’s Supreme Series conveyor systems are manufactured to provide superior performance of UV curable finishes. We design each system around the customer’s specific requirements. These systems are equipped with a closed loop cooling system with both vertical and horizontal ambient airflow. The vertical airflow also acts as vacuum hold-down for lighter weight substrates and excess fume exhaust. Our rugged conveyor top is lined with a Teflon-coated fiberglass mesh belt to transfer many different types of substrates at variable speeds up to 300 feet per minute (8000 sheets per hour). The adjustable lamps can be focused to improve both temperature and UV spectral output. The Supreme Series power supply is located directly below the conveyor and lamp housing and acts as the base for the entire system. The system comes standard with a 400wpi mercury vapor lamp. These conveyor systems are mobile. Their heavy-duty metal casters allow the system to be reconfigured and to move from press to press with great flexibility. Both parabolic and elliptical reflector designs are available with quick and easy changeable reflector inserts to maximize UV output. Standard lengths are 6′, 8′, 11′, 14′, 16′ and 20′ (122, 182, 244, 335, 427, 488, and 610 cm). Other custom lengths and configurations are available on request. Arc lengths available up to 70″‘ (178 cm). Infrared/hot air combination models are also available. 500 and 600wpi lamps are available for more demanding applications. Gallium and iron-additive lamps can also be provided for the most efficient spectral output needed in special UV processes.